The Certified Management Accountant (CMA) is one of the major accounting certifications that can propel you toward increased achievement and success. In order to become a CMA, you have to become a member of the Institute of Management Accountants (IMA), pass the CMA exam, and fulfill education and experience requirements. If you’re wondering, “Why should I become a CMA?”, these four distinct CMA benefits are the answer. Learn about each of them to see how getting certified will advance your accounting career. 1. The CMA opens doors into the business world. The CMA is an advanced, globally-recognized designation that demonstrates an aptitude for making financial decisions for businesses. For some, this business bent makes it preferable to the CPA. If you want to make business decisions, help run a business, or be at all involved in business, the CMA is your ticket. It lets you specialize your accounting practice with an accurate perception of how accounting and business intersect. The CMA is considered the gold-standard in management accounting and is designed to blend accounting practices with business acumen. Passing the CMA exam requires you to understand corporate governance and concepts like responsibility accounting. This knowledge lets you stand in a unique position between the finance side and management side of a business. As CMAs make informed business decisions with finances in mind, many end up taking on more of a consulting role for their clients. The CMA provides an invaluable understanding of finance that companies need to be efficient and profitable. CMAs often work closely with upper management, and their knowledge, skills, and experience influence the direction of these organizations. When equipped with meaningful financial data and analysis, a CMA functions as an important part of the management team. If you are an accountant hoping to be highly involved in a business, getting your CMA is one of the most important things you can do to make that happen. 2. The CMA advances your career. If you want an exciting, fulfilling, and prosperous accounting career, the CMA can deliver. The CMA sets you apart from other accountants by clearly expressing your career goals. Adding the letters “CMA” after your name silently confirms that you don’t want to simply report finances, you want to manage finances. The process of passing the CMA exam exemplifies your willingness to progress your knowledge beyond a bachelors or masters degree. According to the IMA, 87% of CMAs report that getting certified strengthened their ability to move across all areas of business. As you can see, with the CMA, you can not only carve your place in the business world, you can pull up a chair at the conference room table. With their deep grasp of both finance and business concepts, many CMAs rise through the ranks until they lead companies. Job opportunities and career advancement are both in store for you if you pursue your CMA certification. As the demand for accountants continues to increase, the demand for management accountants increases right alongside it. 3. The CMA increases your earning potential. CMAs earn more than non-CMAs. It’s that simple. Globally, accountants with this certification have a 62% higher average salary, which translates to $31,000 more each year. When you look at total compensation (health insurance, retirement, fringe benefits, etc. ), that gap increases further. The difference is growing. In 2016, CMAs only made 45% more than non-CMAs. In the Americas specifically, CMAs made an average of about $10,000 more in 2017 than they did in 2016. There may be any number of reasons why CMAs make more money than non-CMAs. For one, CMAs are better qualified to take management positions, which is where big money lies in the corporate world. Secondly, getting certified requires you to demonstrate high-level management-related skills that are part of the Chief Financial Officer and even the Chief Executive Officer positions. Companies are willing to pay a premium for individuals with such skills. 4. The CMA gives you credibility and status. CMAs understand numbers and finance at a deeper level than other accountants. As the IMA puts it, “CMAs can explain the ‘why’ behind numbers, not just the ‘what.’” Earning the certification requires you to know more about business than most accountants and more about accounting than most business people. So once you earn the CMA, people will go to you for answers to big picture, business-related finance questions. When you’re the expert people turn to for advice, you can expect greater responsibility as well as more credibility and status. CMAs fill the consultant role perfectly and thereby distinguish themselves as an important facet of company operations. 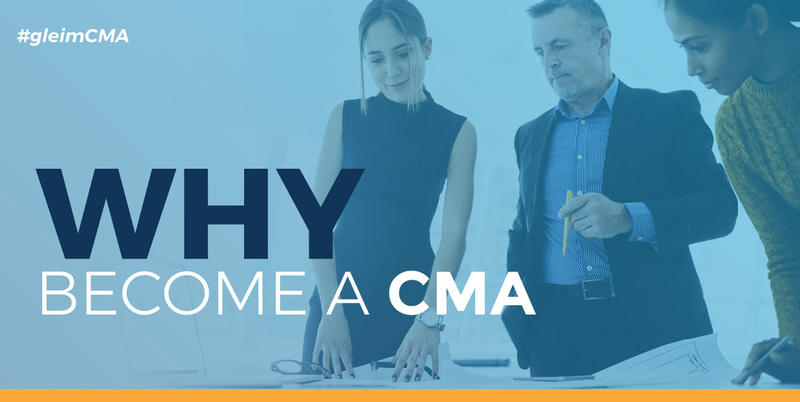 Clearly, becoming a CMA helps your career in many ways, and taking the CMA exam is an important step toward achieving that status. Consequently, choosing the right CMA exam prep is an important step toward passing the CMA exam. Gleim CMA prep has been preparing accountants for top management positions for over 35 years, and our course has trained more CMAs than any other. Our comprehensive content coverage and personalized exam support will give you the confidence to pass the CMA exam the first time. Check out our free CMA exam guide and find out how Gleim can help you get certified efficiently.